When the legendary Japanese filmmaker, Akira Kurosawa, launched Seven Samurai in 1954, he unwittingly gave rise to what would become a Hollywood cinematic franchise. 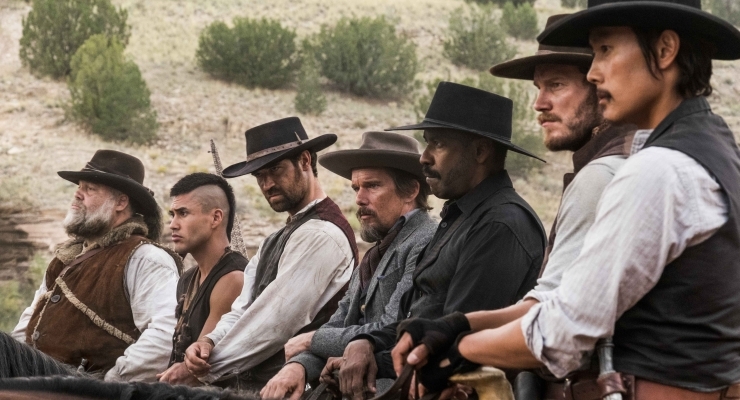 The Magnificent Seven is the second Hollywood reboot of Kurosawa’s saga, and appears 56 years after its American predecessor. The cast is replete with well-known Hollywood names including Denzel Washington, (The Equalizer), Chris Pratt (Jurassic World), Ethan Hawke (Good Kill), Vincent D’Onofrio (Run All Night), and Peter Sarsgaard (Black Mass), directed by Antoine Fuqua (Shooter, Training Day) with a new script by Richard Wenk (The Equalizer) and Nic Pizzolatto (True Detective). Elmer Bernstein’s iconic title theme (dum-dum-ta-dum, dum-ta-dum-ta-dum) is reprised, augmented by classic Western-style music courtesy of the late James Horner (Avatar) and Simon Franglen (The 33). The dusty 1870s Western farming town of Rose Creek now belongs to mining magnate Bartholomew Bogue (Sarsgaard). When Bogue offers the farmers a mere pittance for their land, townsman Matthew Cullen (Matt Bomer, Magic Mike) objects and gets gunned down by the evil businessman. Cullen’s widow, Emma (Haley Bennett, The Equalizer) sets out to hire gunmen who will return Rose Creek to its rightful owners. Emma approaches bounty hunter Sam Chisholm (Washington) who recruits a squad of men with nothing to lose (except perhaps their lives): explosives expert Josh Faraday (Pratt), sharpshooter but battle-weary Goodnight Robicheaux (Hawke), Chinese knife-master Billy Rocks (Byung-Hun Lee, Terminator Genisys), Mexican outlaw Vasquez (Manuel Garcia-Rulfo, Cake), massive trapper Jack Horne (D’Onofrio), and Comanche warrior Red Harvest (Martin Sensmeier, Westworld). The seven men ride into town and begin military-style training of its citizens to get them combat-ready for Bogue’s forces, while Chisholm recruits miners to swell their ranks. After wiping out the “deputies” that Bogue had stationed in Rose Creek, Chisholm lets one Bogue employee, Gavin David (Ritchie Montgomery), escape to call out his boss and deliver a message that the bounty hunter hopes will help Bogue recall a past event that involved the two men. 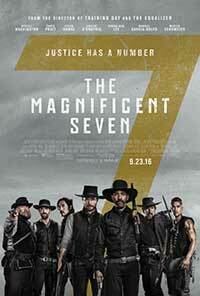 As in the two previous “Seven” films, the climax is the big battle, this time between the huge Bogue army and the villagers, aided by the “magnificent seven.” One over-the-top scene follows another as death and destruction reign supreme leading up to a final reckoning that will surprise no one. With a storyline that, in its broad strokes, resembles the earlier film, this version of the “seven legend” delivers an oppressive level of carnage and graphic violence. The script dredges up cliché after cliché from the standard Western lexicon (Emma: “I seek righteousness but I’ll take revenge,” Chisholm: “You tell your boss if he wants his town, come see me,” or Bogue with a line cribbed from the original film: “If God did not want them sheared, he wouldn’t have made them sheep.”) Putting such issues aside, veteran director Fuqua delivers a prime example of his current body of work: gobs of action and an unswerving point of view. Mauro Fiore (Tears of the Sun) is the film’s unsung hero with camera work that produced a shot-in-35mm Panavision source and, mastered in 2K, draws us, like it or not, into the often disturbing images on the screen. With a lineup that poses no serious threat to the 1960 hero-laden cast featuring Yul Brynner, Steve McQueen, James Coburn, Charles Bronson, Eli Wallach, and Robert Vaughn, this newest Magnificent Seven installment also lacks the dramatic balance of the earlier film which had more lighthearted moments, a more probing confrontation between the bandit leader and his Mag 7 counterpart, and a charming little romantic side story. Recommended mainly for cineastes who favor gratuitous violence and boom-laden sound tracks over character development and dialogue. A remake of a classic Western film that favors gratuitous violence and a boom-boom soundtrack over character development and dialogue.